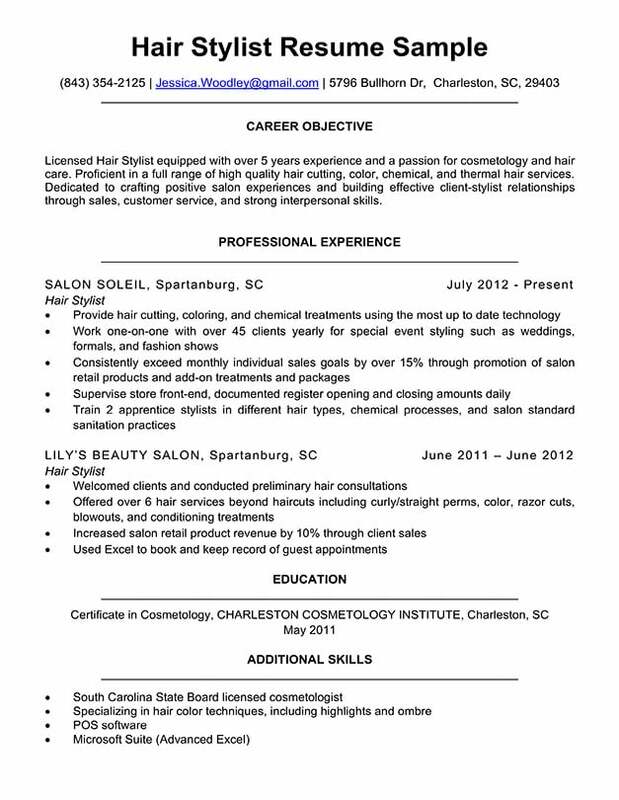 Use our hair stylist resume sample and industry tips to perfect your resume and ensure your best chances at landing a new job. Below, our resume experts have crafted the ideal resume for people seeking to start or further their career in the hairstyling industry. And, if you are strapped for time, give our easy-to-use resume generator a try. Not your ideal resume design? Find a resume template that’s right for you. The following image is of the matching cover letter. Click the image to enlarge. Need some extra help? Check out our expansive cover letter collection for some pointers for crafting your cover letter. Licensed Hair Stylist equipped with over 5 years experience and a passion for cosmetology and hair care. Proficient in a full range of high quality hair cutting, color, chemical, and thermal hair services. Dedicated to crafting positive salon experiences and building effective client-stylist relationships through sales, customer service, and strong interpersonal skills. The first hurdle to landing a hairstylist job is obtaining a license by your state cosmetology board or a similar professional organization. All prospective hairstylists are expected to competently wield a pair of hair shears, so including any customer service experience and expert knowledge in your resume will place you a cut above other applicants. Including any customer service experience and expert knowledge in your resume will place you a cut above other applicants. Beginning your resume with a Resume Objective is a great way to introduce yourself as an applicant, and list qualifications which you can then elaborate in other sections. We’ll look at this applicant’s Career Objective to learn exactly which points you should include to start your resume off strong. Sentence 1: Licensed Hair Stylist equipped with over 5 years experience and a passion for cosmetology and hair care. A cosmetology license is required for professional hair stylists, so be sure to first and foremost let your hiring manager know that you are certified. Including the number of years of work experience you have will substantiate your skills as a hair stylist. Sentence 2: Proficient in a full range of high quality hair cutting, color, chemical, and thermal hair services. Describe your skill set! Sell yourself as a versatile hair stylist. If you feel as though you’re lacking knowledge in some areas, stress that you are motivated to learn. Sentence 3: Dedicated to crafting positive salon experiences and building effective client-stylist relationships through sales, customer service, and strong interpersonal skills. Wrap it up; include any additional skills you have that relate to the hair stylist position. Above all, tell the hiring manager how you will apply your skills to benefit their business and goals. As a hairstylist, you will spend nearly every moment on the job interacting with customers. No matter how technically skilled you are, you need to be able to connect with your clients to sell your services and products. Make your sales skills stand out with specific figures. Simply writing, “increased salon retail revenue,” means nothing to your potential employer who has no knowledge of your last workplace, the number of clients you worked with, or what exactly you sold. Including specific numbers in your descriptions not only show exactly how capable you are, but they also stick out in the mind of hiring managers. Always quantify where you can. If you are just starting out and don’t have solid sales numbers to show off, list other customer service jobs in your resume. Waitressing and working in grocery stores may seem industries away from cosmetology, but what salon hiring managers will see is someone who can provide an excellent customer service experience and positively represent their business. Hairstyling is an industry that follows trends, and demand for certain services and styles will fluctuate yearly and even by season. Beyond the initial schooling and certification, it’s important to emphasize on your resume that you’re keeping up-to-date and being trained in the latest hair care trends and technologies. These skills and techniques can be added into the professional experience section of your resume as you discuss the job duties you’ve performed at previous salons. Another area to list specific areas of expertise is in the additional skills section. By placing special emphasis on specific skills, you can brand yourself as a specialist of certain techniques or client demographics. In this sample resume, the applicant emphasized an area of expertise and made sure to include her involvement in special styling services. Highlight skills you can do better than other applicants, but be careful not to pigeonhole yourself. Following all three tips by conveying your hairstyling background, sales finesse, and niche skills will show hiring managers that you are a capable hairstylist and a desirable candidate for their salon.